Whether you are looking to explore questions of faith, or looking for a community of people to belong to, we would love to meet you! Come along on a Sunday morning or you can join us in any of the activities going on during the week. We've got things going on for you if you are three, thirty or more senior in years! Check out this site, or please do contact the office for more information. Messy Church takes place once a month and is a time when families can come together for a time of creativity, music and to eat together. Are you a parent, grandparent or carer of preschool children? 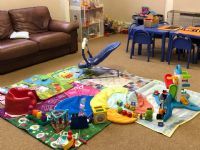 Our Toddler Group meets every Thursday morning from 10 - 11.30 am. There is no charge and everyone is welcome! Something causing you real stress? Or just wondering if there's something that can make sense of life? We would like to send you a Try Praying booklet which suggests you pray for seven days, and discover the adventure of a lifetime; getting to know God! Contact us and we'll send you one.